Gallery Archive - Page 2 of 5 - American Porch, LLC. J.D. of Philadelphia, PA writes “A few years ago I purchased a primed cedar rail kit with custom turned spindles. The custom cut profile I created was for a baseball bat and ball spindle. The rail kit was easy to install and I enjoyed working with Western Spindle. Some photos are attached to this and the next email. Nothing says “Welcome home for Christmas” like a well decorated Victorian Porch! Thanks to S.G. of Saratoga Springs, NY for sharing. This is a fun one. 4″ class 3-piece Porch Rail System made to match the curve of the rounded deck. The builder was very creative in making sills for lanterns that, used in conjunction with the curved rail, really sets this deck apart. This also shows the use of the newel post anchors well. Because it is a decorative balustrade (no access and therefore no building codes apply), they used a 30″ Top Rail Height. Beautiful work guys! A huge “Thank You” to this Minnesota customer for sending pictures of this beautiful porch. 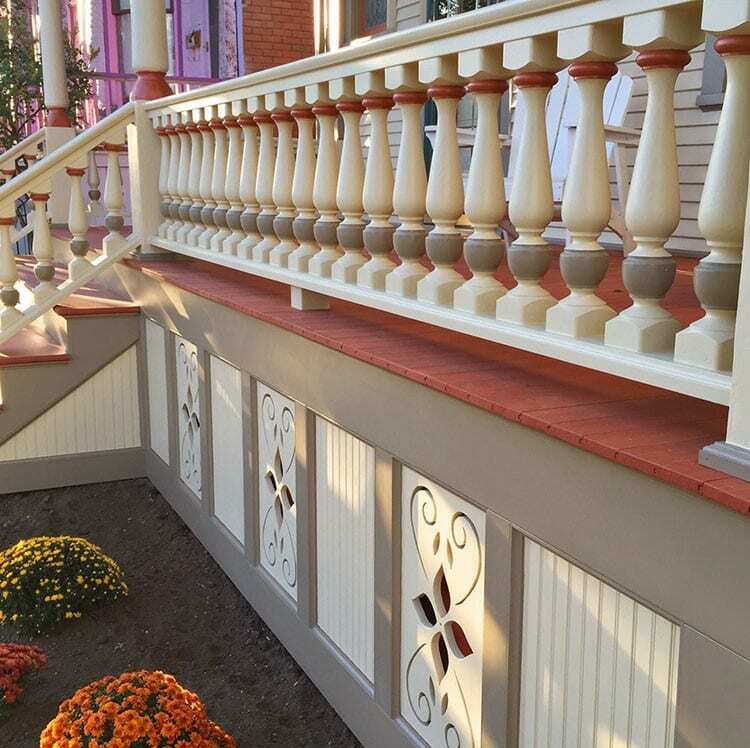 This homeowner wanted to keep the profile of their original porch railing. We reproduced the rail profile in cedar, with the slight modification of a sloped bottom rail and notched spindles to avoid problems with water sitting on the bottom rail.